happy easter ma & pa moss. and everyone else! it was so nice to catch up with mary & syd friday. 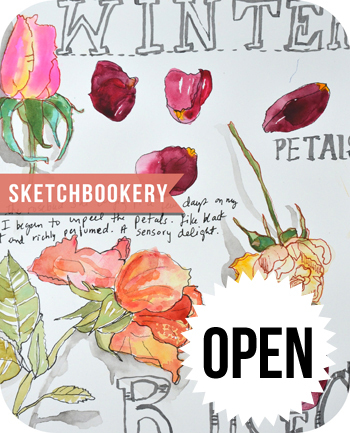 we sat in the garden and did a bit of sketchbookery. these are mary’s old childhood paints. she still uses them. are you familiar with the concept of tsukumogami? they are artifact spirits from japanese folklore. it is said once an object reaches it’s hundredth birthday, it becomes self-aware and alive; sentient. it’s a lovely way to think of taking care of things we treasure versus constantly replacing with new. but the concept of course, is much more complex than this. here i present only the simplified version. when i read about it i thought of many things, but especially of being a steward of an object rather than an owner. mary’s paints are on their way to becoming alive. the thought of that is enchanting. i painted some of my shells. former homes of live things, of sea creatures. i have been very lucky to find a beautiful collection on my last 2 visits to the santa barbara coast. yesterday i found 3 mermaid purses! a baby shark, skate, or ray is born inside then eats his way out and swims off into the deep. these purses were open on one end so i knew nothing could still be inside. i think this is my first whelk shell i’ve ever found that hasn’t been broken. broken or not, they are beautiful. this one still had the living predatory sea snail inside. i tossed him out into a tide pool away from the shore so he wouldn’t be found and taken, or pried from his home. i was delighted to find this painter on the shore working on a seascape. i put my collection on the sea wall to have a look. let’s do this together okay? i’ll send you your ticket. we’ll all have separate rooms. maybe there will be a special painting salon and we can meet there in the late afternoon and watch the lake turn golden. while we paint and write. at the end of the week we can all drift apart and explore the italian countryside. i guess i should stop writing and climb into my chariot. head for home. Happy Easter behind behind digging the the emails. Always a delight to find a list from you hidden in the heap like a jewel. Italy trip sounds delightful. Let’s go. Thank you for the photos of the shells and your sketch of them. Just lovely work! Happy Easter to you, dear Mary Ann! And thank you as always for sharing your world and the beauty of it. I wish I could go to Italy on that retreat! Alas, the school year will be in full force and I can’t leave. There’s also :cough: this little thing called :cough: money. not at all. i just so happened to see the flyer on a patio after my morning beach ramble! Love your shell collection. I picked up a small baggie full of lovelies one afternoon on Kangaroo Island on my recent trip to Australia. It was so refreshing to poke along a beach, stooping over to pick up a small treasure or two, smell the sea air from the beach rather than from the stateroom veranda and do a little autumn(!!!) basking in the sun. It was, truly, bliss. I used your idea for journal covers by using paint-by-number paintings for my Aussie journal and it worked out beautifully. YOU taught me to make a journal and now I love using your “eyeball” method along with my large self-healing, gridded cutting map to put together my travel journals. You have shared information and taught me so many useful things over the years. Thank you. You have enriched my travel experiences more than you know by teaching me to make my own little books. As always, thanks for sharing your travels with your devoted readers. i enjoyed following along on your epic adventure. twas glorious! Wow! Love the mermaid purses. Who knew that’s how they began life? Not me. And what about the pants dad was wearing in that photo? Plaid polyester! I hope someone else is stewarding them right this second! those are best not brought to life!